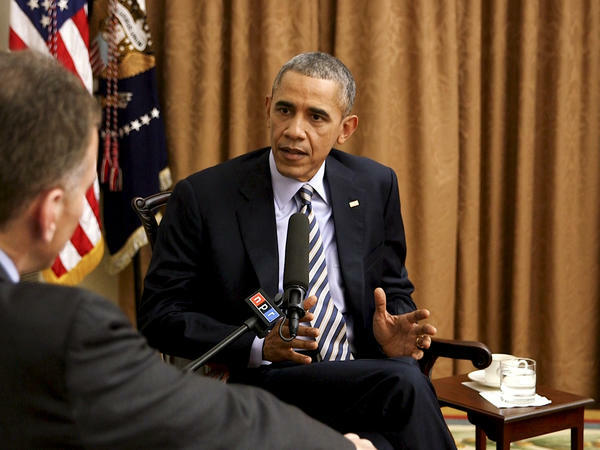 NPR's Steve Inskeep interviews President Obama at the White House. In an interview with NPR's Steve Inskeep late last week, President Obama spoke at length on the subject of identity. The question of who we are as Americans, Obama said, is at the center of the American experience and has been since the country's founding. We wanted to share that part of their conversation; also, check out what the president had to say about Donald Trump, college protests and lots more. STEVE INSKEEP: Mr. President, we are nearing the end of a year where the question of national identity, who we are, has been a part of one large event after another. I made a list here, in fact. Gay marriage, the Black Lives Matter movement, immigration, the question of whether to admit Syrian refugees into the country, the question of whether to admit Muslims into the country. All of them in some sense touch on that question of who we are. What is the reason, the cause, what has caused that issue of who we are to come forward again and again and again at this moment in history? PRESIDENT OBAMA: Steve, it never went away. That's at the center of the American experience. You pick any year or any decade in American history, and this question has been wrestled with. Sometimes it pops up a little more prominently, sometimes it gets tamped down a little bit, but this has been true since the founding and the central question of slavery, and who is a citizen and who is not. It was a debate that took place when, you know, there were signs on the doors saying "no Irish need apply." It was a debate that happened during Japanese internment in World War II. It was obviously a debate in the South for most of our history and during the civil rights movement. And it's been a debate that we've been having around issues of the LGBT community for at least most of my adult life. So I don't think there's anything new about it. I do think that the country is inexorably changing, I believe in all kinds of positive ways. I think we are — when I talk to my daughters and their friends, I think they are more tolerant, more welcoming of people who are different than them, more sophisticated about different cultures and what's happening around the world. But I do think that when you combine that demographic change with all the economic stresses that people have been going through because of the financial crisis, because of technology, because of globalization, the fact that wages and incomes have been flatlining for some time, and that particularly blue-collar men have had a lot of trouble in this new economy, where they are no longer getting the same bargain that they got when they were going to a factory and able to support their families on a single paycheck, you combine those things and it means that there is going to be potential anger, frustration, fear. Some of it justified, but just misdirected. I think somebody like Mr. Trump is taking advantage of that. That's what he's exploiting during the course of his campaign. But in other cases an issue like Black Lives Matter and the question of whether, you know, the criminal justice system applies equally to everybody, that's been an issue in the African-American community, and to some degree in the Latino community, for decades. There's no black family that hasn't had a conversation around the kitchen table about driving while black and being profiled and being stopped. I think really what's changed over the last several years is the pervasiveness of smartphones and the visuals that suddenly have sparked a conversation about how we can deal with it. And although it's uncomfortable sometimes, I actually think that over the long term it's how, in Dr. King's word, you get a disinfectant by applying sunlight to it, and people see, you know what? This is a true problem, and as a consequence we've been able to have conversations that might not have happened 20, 30, 40 years ago, with police chiefs who genuinely want to do the right thing, law enforcement who recognize that they are going to be able to deal with crime more effectively if they've got the trust of the communities. You know, during that process there's going to be some noise and some discomfort, but I am absolutely confident that over the long term, it leads to a fair, more just, healthier America. Sometimes progress is a little uncomfortable.